Can playing it safe be dangerous? German Chancellor Angela Merkel might muse on this question as she steers an ultra-cautious path through electoral minefields. Her party is fighting to keep control of the south-western state of Baden-Wuerttemberg this Sunday. The result will reveal whether her recent embrace of the most careful positions has stopped the party from being dumped out of office for the first time since 1953. In the past week, she has done a hand-brake turn on energy policy. Her critics said she was bowing to the anti-nuclear opposition in Baden-Wuerttemberg where there are close-run and important elections this weekend. After her previous policy of extending the lives of nuclear power stations, one German magazine concluded: "It's as if the Pope were suddenly advocating the use of birth control pills." Another German headline called Mrs Merkel "A Chancellor Made of Pudding, not Iron", contrasting her with "Iron Lady" Margaret Thatcher, Britain's former prime minister. Shortly after the nuclear shift, Mrs Merkel's government conspicuously declined to get involved with the military action against Libya. Germany aligned with Russia and China in the vote at the United Nations Security Council, rather than with Britain, France and the United States. This is not the usual grouping of friends and acquaintances, particularly since Germany usually prides itself on high moral purpose in its foreign engagement, and the war against Col Gaddafi was prompted by the possibility of a slaughter of Libyan citizens. She has emphasised that German taxpayers' money for euro bail-outs will be used only with tight strings attached, to the dismay of those who think she should be hammering away more at how the eurozone has benefited Germany. And earlier in the year, she toughened her language on multiculturalism ("multi-culti," she said, using the slightly disparaging term, "has failed, utterly failed"), as opinion polls indicated widespread discontent about Islam in Germany. Other ministers emphasised its place in German life, and also how they thought that the country's economy needed immigration, but Mrs Merkel emphasised a more populist - or at least popular - view. Of course, democracy is about politicians listening to citizens and acting on their behalf. And all of the above changes may have merit. Just because you do something that is popular does not mean it is the wrong thing to do. She would no doubt argue that the events in Japan changed the nuclear argument. But there is now a danger for her of a perception that she is bowing excessively to the prevailing political wind. Here's how Spiegel puts it: "Germany is witnessing a stunning political about-face". It said she had gone from being "an enthusiastic supporter" of nuclear energy to arguing for it to be phased out as soon as possible. 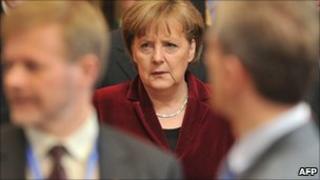 She made the change most obvious at an election rally in the town of Offenburg in Baden-Wuerttemberg. She arrived to be greeted by anti-nuclear protesters. One simply chanted "Fukushima" repeatedly like a mantra. Inside the hall, one protester held aloft the Japanese flag. The police confronted him before the chancellor arrived, not to curtail his right to protest, but because they thought his pole was too big. As Chancellor Merkel spoke, her new tone - and message - emerged. Atomic power was for her a "bridging technology", to which the protesters invariably responded in an old-fashioned heckle that the bridge was broken. This is not a new line from the Chancellor. She has described nuclear before as the necessary means to a greener future. But she went on to say that she wanted to phase out nuclear power in Germany by 2020, in contrast to her previous decision to extend the lives of Germany's nuclear power stations until 2035. Of course, wanting to get rid of nuclear power and actually getting rid of it are different things, but you still cannot doubt that change of emphasis. It comes as the people of Baden-Wuerttemberg go to the polls on Sunday, with the Greens rising in their fortunes and the CDU falling in theirs. Latest surveys put the Greens on around 25% compared with Angela Merkel's Christian Democrats on 38%. If that were carried through in Sunday's vote, the Greens could end up in coalition with the Social Democrat SPD, who are on around 22%. The opinion polls also indicate some scepticism about the motive for the change in policy. One found 68% of those polled thought it was for electoral purposes; just 26% said it was "credible". Of course, opinion polls are not votes - and a regional election isn't a federal election. But if the CDU lost Baden-Wuerttemberg, it would indicate that old loyalties were being tested. And Mrs Merkel's task of winning the federal election in 2013 would seem much harder.